Lawmakers favor $14 million lawsuit against U.S. to gain control of public lands. Attorneys for Davillier Law Group present their report to the Legislature. Utah should sue the United States. That's the conclusion reached by the Davillier Law Group, hired by the Utah Legislature to investigate the feasibility of having the U.S. Supreme Court decide whether or not state government should control federal public lands. In its 145-page report, delivered Dec. 9 to members of the Legislature's Commission for the Stewardship of Public Lands, the law group wrote that while nearly every other legal opinion across the country has concluded that such an attempt has almost no chance of success, a recent Supreme Court decision sheds new light on the matter. "Our country can only function properly when states are treated equally," said George Wentz, a partner at Davillier, "and we saw that evidenced last year when the Supreme Court struck down key provisions of the Voting Rights Act." That ruling invalidated provisions of the 1965 act targeting states with demonstrated track records of racial voting discrimination. The act required such states to get permission from the U.S. Attorney General's office before altering state voting laws. Wentz claims that the U.S. government's retention of public lands in Utah "relegates Utah to second-class status," because the state cannot tax or sell off those lands. "The idea that the federal government can hold onto these lands indefinitely is wrong," Wentz added, "That power simply doesn't exist." The report was eagerly received by lawmakers who have been trying since 2012 to take control of federal lands in Utah, when Rep. Ken Ivory, R-West Jordan, passed the Transfer of Public Lands Act. But not all members of the commission were ready to accept the report at face value. Sen. Jim Dabakis and Rep. Joel Briscoe, both Democrats representing Salt Lake City districts, questioned the report's motives. "I look at the [Davillier Law Group] lawyers listed here," said Dabakis, "and I see all people who hold the same ideology." He challenged the report's authors to provide "the name of a single lawyer you worked with or talked to" who doesn't represent the pro-public-land-takeover viewpoint. "This feels like we're asking a barber whether or not we should get a haircut," he said. Ivory took umbrage with Dabakis' comments, noting that in June, Dabakis had voted in support of contracting with Davillier. Ivory added that he believed Dabakis was trying to force partisanship into the issue. "I don't need lectures from [Rep. Ivory]," Dabakis fired back. "Not everyone agrees with him on this issue, and I'm representing the deep concerns of my constituents." Briscoe, meanwhile, pointed to a March 26, 2012 USA Today article that quoted Richard Seamon, an attorney working with Davillier, as saying attempts to take over public lands are "doomed to fail" and are akin to "civil disobedience" by lawmakers. Seamon responded that his comments in that article were specific to a similar attempt by the Arizona Legislature. The attempt failed, but he did not believe Utah would meet a similar fate. One of the legal hurdles facing any potential lawsuit is Utah's 1894 Enabling Act, which admitted Utah into the union. The act says that the people and state of Utah "forever disclaim all right and title to the unappropriated public lands lying within the boundaries" of the state. But the Davillier Group thinks it can get around such language. 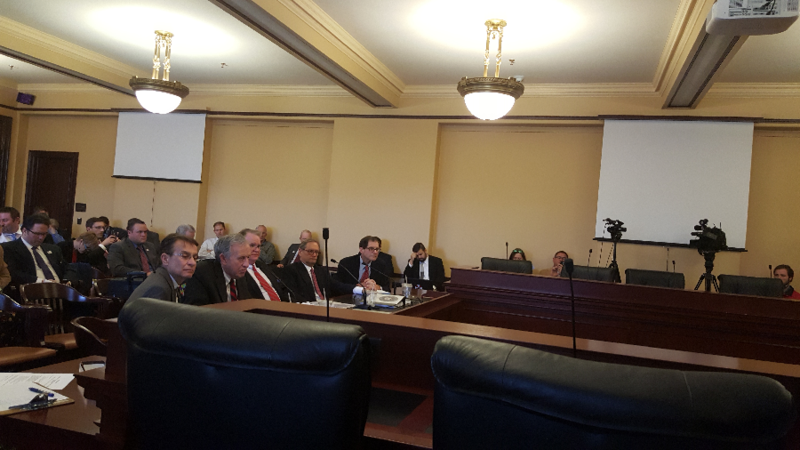 "Utah's  Legislature had no authority to bind the 2015 Legislature," said attorney Ronald Rotunda, who is working on Davillier's team. Despite Davillier's optimism, their report does caution that any litigation would be "time consuming, expensive, and never certain in outcome." In fact, the report estimates that even if Utah were able to bypass the Utah district court, the appellate court, and move the case directly to the U.S. Supreme Court through a legal process called original jurisdiction, the total cost to Utah taxpayers is estimated to be $14 million. "And let me be clear," says Wentz, "estimates on time and costs to major court cases like this may be educated, but they're still educated guesses." The report also predicts that even if Utah prevails, it's unlikely that the Supreme Court would simply instruct the federal agencies to turn over the land to Utah. Instead, says the report, "a subsequent political solution negotiated by all stakeholders would most likely be required to resolve the issue." It added that Utah ownership of these lands is only "a possible outcome." Rep. Briscoe questioned the lack of healthy debate about the report's conclusions. "I'm concerned that this is being accepted without question," said Briscoe, "that Utah could manage these lands better than the federal government. If you want me to accept that as fact, then show me. Show me how." The Democratic lawmaker also bristled at the price, "I'm stunned by the $14 million figure—imagine what else we could spend that money on." Plus, if $14 million turned out to be a lowball estimate, Briscoe stated it was too much money to "gamble on unproven" legal theories. Rep. Keven Stratton, R-Orem, who co-chairs the commission, said the price tag didn't worry him. "Even if it grew to $50 million," said Stratton, he still believes it to be worth the price because of the potential money Utah stands to gain if it gained control of the land. A previous study commissioned by lawmakers, and conducted by the University of Utah, Utah State University, and Weber State University, concluded that even if Utah were able to prevail in the case, the cost of actually managing millions of acres of public lands without federal funds would cost the state roughly $280 million annually. In the end, the commission voted 6-to-2 along party lines to have the Davillier Law Group send a draft to Utah Attorney General Sean Reyes, who will make the ultimate decision of whether or not to proceed with the lawsuit. Reyes has already signaled he is open to moving forward with the lawsuit. Testifying before the commission last year, the Assistant Attorney General Tony Rampton told lawmakers that, while it may be "a tough case, it is a case that can be made." The state's top attorney had already concluded last year that the Equal Footing doctrine has the highest likelihood of success, and Rampton speculated that at least five of the nine SCOTUS justices might be open to hearing the arguments. President’s visit, national monument reduction spurs Utahns to make a statement.